Confidential, public, Central Connecticut Hepatitis Community support group for diagnosed, family, friends, interested individuals and those with other liver maladies. 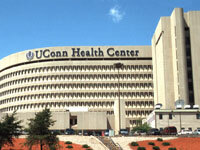 Regular meetings are held on second Wednesdays from 7-9pm at UConn Health Center (Academic Research Building, Large Conference Room EG013) , 263 Farmington Avenue, Farmington, Connecticut. Please stop back to this web page within 2 hours of regular meetings and events to see if there is any adjustments to scheduling for inclement weather or other unexpected changes. Anonymously visit to experience periodic educational segments (with professional speakers from various fields), to talk to those afflicted (some considering treatment, some on treatment, and some finished treatment) and family/ friends/ supporters or to just hear what these diseases are all about. Should you have questions, email us at support@CCHCgroup.org.